In Conquest and Redemption, Gregg J. Rickman explains how the Nazis stole the possessions of their Jewish victims and obtained the cooperation of institutions across Europe in these crimes of convenience. He also describes how those institutions are being brought to justice, sixty years later, for their retention of their ill-gotten gains. Rickman not only explains how the robbery was accomplished, tracked, stalled, and then finally reversed, but also clearly shows the ways in which robbery was inextricably connected to the murder of the Jews. The Nazis took everything from Jews--their families, their possessions, and even their names. As with the murder of Jews, the Nazis' robbery was an organized, institutionalized effort. Jews were isolated, robbed, and left homeless, regarded as parasites in the Nazis' eyes, and thus fair game. In short, the organized robbery of the Jews facilitated their slaughter. How did the German people come to believe that it was permissible to isolate, outlaw, rob, and murder Jews? A partial explanation can be found in the Nazis' creation of a virtual religion of German nationalism and homogeneity that delegitimized Jews as a people and as individuals. This belief system was expressed through a complex structure of religious rules, practices, and institutions. While Nazi ideology was the guiding principle, how that ideology was formed and how it was applied is important to understand if one is to fully grasp the Holocaust. Rickman painstakingly describes the structural composition and motivation for the plundering of Jewish assets. The Holocaust will always remain a memory of unequalled pain and suffering, but, as Rickman shows, the return of stolen goods to their survivors is a partial victory for the long aggrieved. 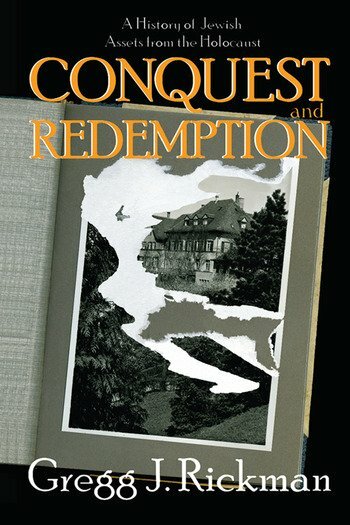 Conquest and Redemption will be of interest to students and scholars in the history of the Holocaust and its aftermath.